The year has rushed by and I can’t believe that it’s already December. As usual I haven’t bought a present or written a card, and as I’m not cooking the big meal this year for once haven’t even made a pudding or cake. I usually wait till after my birthday on December 7th to get going but this year may be a bit more organised as I’m off to Paris tomorrow for a short stay and hope to get some shopping done there. And in the next few days I’ll be blogging on what to look out for at Penshurst next week with some of my favourite ingredients, Christmas offers and specialities from our stallholders. 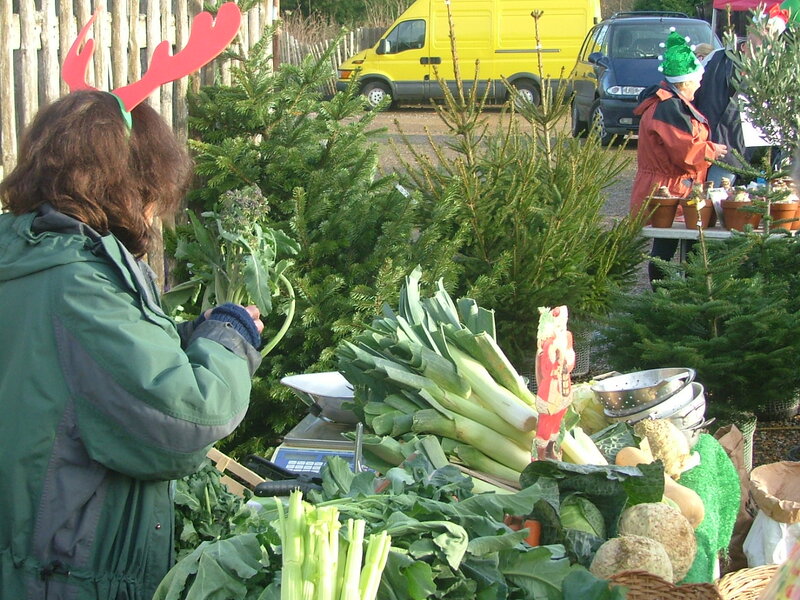 Just like stir-up Sunday and opening the first door on the advent calendar, a visit to your local Farmers’ market is the perfect way to get into the true spirit of Christmas this year. The sights, scents and sounds of the season are all present as you mingle with other food enthusiasts, intent on selecting the best produce to enjoy at this special time of year, or simply there to soak up the atmosphere. Whether it’s shopping for tried and trusted old favourites, getting advice on the best way to cook your carefully selected produce from those most qualified to offer it, maybe trying something new for the first time – it’s all a world away from pushing a frenzied trolley round the supermarket. To make sure you get the best from your visit and spend your budget wisely, be sure to plan ahead and do a bit of research. Sit down a few days before your market and make lists of what you want from your trip. Check on line at the Kent Farmers Market Association website www.kfma.org.uk/ for advice on individual markets, which suppliers you will find there, and what to buy in season. Then look further online at your favourite supplier’s own websites to see if you can order ahead to pick up at the market or if your market is monthly, nearer to the big day. Are you planning to try a new approach this year – maybe a succulent goose or magnificent roast of rare breed beef or pork? Or just going with tradition and sticking with turkey? You might be catering for smaller numbers so a pheasant or wild duck could be the best choice. And wonderful sea-fresh turbot or halibut are both very special for all kinds of celebrations. Whichever you choose, buying locally makes sense on every level. Smaller producers can select the best breeds for flavour and respond to local conditions to ensure the very finest results. You’ll also be supporting vital regional industry and have the satisfaction of caring for the environment too. Once you’ve made your list of what you intend to buy at the market (and don’t forget it’s also the ideal place to pick up all kinds of special foodie gifts too), it’s a good idea to make a few simple preparations for your trip. If you haven’t ordered ahead and there is something you can’t manage without then aim to get there early so you don’t miss that special purchase. Make a trip to the cash machine ahead of your visit. Some producers do accept cards but many smaller ones don’t have the facilities so be prepared. It’s intensely frustrating to run out of money before you’ve bought all your essentials. Come with plenty of bags to carry away your goodies, and a freezer bag is always a good idea if you want to leave perishable goods in the car (unless we have a repeat of the arctic weather of some recent winters!) And before you leave home it’s a great idea to check you have enough fridge and freezer space for your purchases – storing them properly is vital to maintain flavour and quality. The colder weather following on from a warm and settled summer and autumn means there is a real bounty of local produce available in perfect condition for celebrating. So why not make a feature of foods from the area for your Christmas entertaining this year? The whole gamut from great meat, fish and vegetables are all wonderfully complemented by local wines and beers both benefiting from the marvelous growing season of 2013. Set these alongside award-winning cheeses, jams and chutneys, puddings and pies, and you have the basis of a real feast. If you are a scratch cook then all the ingredients are there but if shortage of time (or maybe a “skill gap”!) keeps you out of the kitchen, then a plethora of ready-made goods are all available to ease the worry and stress that sadly often goes with entertaining at Christmas. Celebrating the winter solstice with feasts, frolics and fun goes back way beyond Christian traditions. With the harvest all in and a long dark winter to face, folk needed a lift and many of the foods we associate with the season have been featuring on menus for centuries. Cranberries, turkey and pumpkins may have come to us from the new world but we can counter with chestnuts, celeriac, parsnips, Brussels sprouts, goose, pheasant, partridge, venison, wild duck, oyster, mussels and sea bass. Plan your menu around these and you won’t go far wrong. Don’t forget the extras such as sausagemeat and bacon for the trimmings, maybe a chicken liver pate or local smoked salmon to serve as a starter, and to round up, traditional Christmas pudding served with thick cream or ice cream, and a platter of local cheeses. As well as all the traditional festive produce, there are plenty of specialty foods and dishes at the market to help save time and feed crowds over the holiday. A gammon or ham, pates and terrines, soups and curries, all are worth finding a space for in the fridge or freezer to bring out for unexpected guests or when you are just too overwhelmed to prepare yet another meal. Also don’t forget to stock up on chutneys, preserves and relishes to go with your cold cuts. 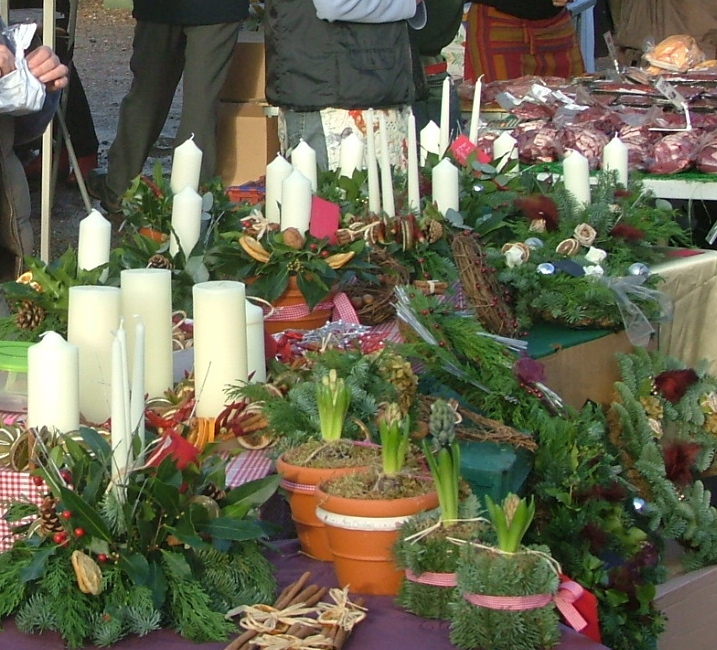 In fact why not go the whole way and serve a special local market spread on Boxing Day or for a party – platters of local meats, cheeses, with a couple of salads and the trimmings are excellent grazing food. And a few extra loaves of good bread tucked in the freezer for turkey sandwiches or to go with a bowl of soup will always be popular. It’s when you try a classic roast joint that the difference in flavour and texture of really good local pork more than comes into its own. The aroma of the meat cooking will tell you that this is something special; served with my take on apple sauce and a ginger-infused sweet potato Dauphinoise, there is nothing better for a Christmas meal with a difference. 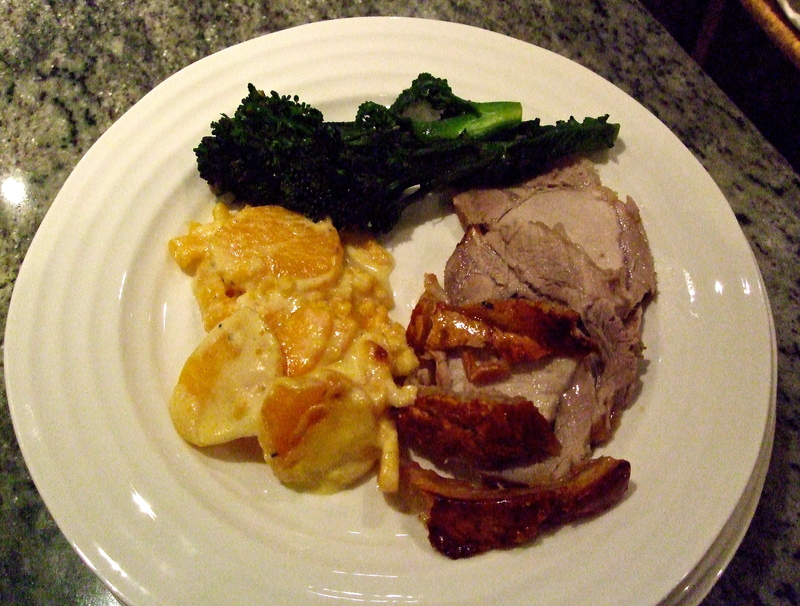 The potato dish also goes really well with any rich meat such as goose or duck, and makes a good main dish for vegetarians with the addition of some goat’s cheese scattered through the potato layers. Last year I cooked a gammon on Christmas eve and served it with this sweet potato dish and braised red cabbage – I think it was one of the best meals I’ve ever cooked! 1 Remove the pork joint from the fridge an hour in advance to let the meat come to room temperature. Preheat the oven to 220C gas 7. Pat the skin of the pork dry with kitchen paper then rub well with salt. Place in a roasting tin, skin side up. 2 Roast for 30 minutes then turn down the oven to 170C gas 3 and cook for 25 minutes per 500g until the meat juices run clear when the joint is pierced with a skewer. While the meat is cooking, make the apple sauce. Place the apple slices in a small pan with the sugar and cook gently until the apples break down. Stir in the mint and add more sugar to taste. 3 Remove the meat from the oven, place on a warm dish and cover loosely with foil. Leave to rest for at least 15 minutes but longer if possible (up to 45 minutes in a warm place). While the meat is resting make the gravy. Pour off most of the fat from the tin and place back on the hob. Stir in the flour and cook for a minute or two. Whisk in the wine then gradually add the water or stock. Bring back to the boil stirring, simmer for a couple of minutes then stir in the mustard and season to taste. Strain if you want a smoother gravy. Serve with the sliced pork and apple mint sauce. 1 Preheat the oven to 200C Gas 6. Put the cream, milk, garlic, ginger and seasoning together in a large pan. Bring to the boil then add the sliced sweet potato a few at a time so each slice is coated in the liquid. Cover the pan and simmer gently for 10 minutes until the potato is starting to soften. 2 Spoon the potatoes and their liquid into a buttered 2 litre shallow ovenproof dish, arranging the top layer overlapping neatly. Cook alongside the pork for the last 25 – 30 minutes until the top is golden. Serve with the pork. This entry was posted in Farmers Market, In season, Local food, Recipes, Uncategorized and tagged Christmas market, farmers markets, Farmers’ market, Penshurst farmers market, roast pork, What to buy. Bookmark the permalink.